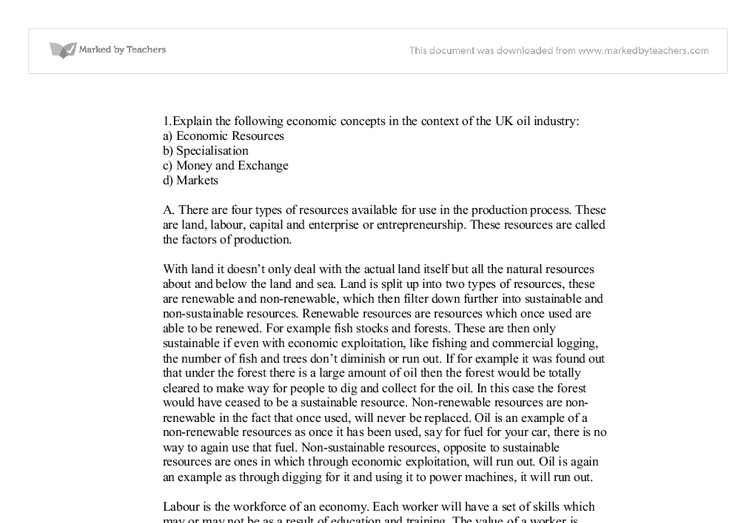 1.Explain the following economic concepts in the context of the UK oil industry: a) Economic Resources b) Specialisation c) Money and Exchange d) Markets A. There are four types of resources available for use in the production process. These are land, labour, capital and enterprise or entrepreneurship. 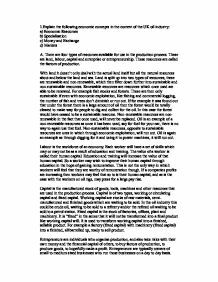 These resources are called the factors of production. With land it doesn't only deal with the actual land itself but all the natural resources about and below the land and sea. Land is split up into two types of resources, these are renewable and non-renewable, which then filter down further into sustainable and non-sustainable resources. Renewable resources are resources which once used are able to be renewed. For example fish stocks and forests. These are then only sustainable if even with economic exploitation, like fishing and commercial logging, the number of fish and trees don't diminish or run out. If for example it was found out that under the forest there is a large amount of oil then the forest would be totally cleared to make way for people to dig and collect for the oil. In this case the forest would have ceased to be a sustainable resource. Non-renewable resources are non-renewable in the fact that once used, will never be replaced. Oil is an example of a non-renewable resources as once it has been used, say for fuel for your car, there is no way to again use that fuel. ...read more. Entrepreneurs are typically owners of small to medium sized businesses who run those businesses on a day to day basis. However, managers in companies can also be entrepreneurial if they both organise resources and take risks on behalf of their company. Recently their has been a lot less entrepreneurial activity with the North Sea Oil producers cutting back their spending on investment in exploration and new equipment because of higher costs and taxes. Entrepreneurs basically spend money to buy factors of production, to produce a product, to sell and make a profit. Because of the higher costs and taxes on the oil industry the risks have become much larger and so not many managers or entrepreneurs are willing to take them. 1B) Specialisation is where an individual, firm or country produces a limited range of goods in co-operation with others so that together they can produce a complete range of goods. This is done to increase productivity. Looking at oil, different firms will specialise in the different steps of turning oil in the ground into a final product. One firm may specialise in finding the oil - exploration, another may specialise in extracting the crude oil, another in refining it and another in selling it. Sometimes however one firm may specialise in a number, if not all of the steps. ...read more. That is not to say that they aren't always wanting to, but as the same amount of oil in 06 can now be sold at a higher price. However it is due to the scarcity and high demand of oil that makes it so expensive. So if the companies found more oil the scarcity would drop and so would the price, so the oil companies may just want to make sure they know where oil defiantly is and at a later date extract it. Or extract it now and control the amount that they release, so although there is more barrels of oil there isn't more available to the motorist and so the price stays high. I think this is what is done with diamonds. B. The UK governments would want to buy a lot of oil so that motorists could still drive their cars. Or, as oil is very expensive they may wish to explore alternative forms of fuel. Or, as they have done, publicise other modes of transport, such as buses and cycling. C. The UK motorists would want to switch to cars with better mileage to reduce the amount they are spending on fuel, or try other modes of transport. D. As the profits of the oil companies go up, even with people not driving so much, and switching to cars with better mileage, workers on the North Sea oil rigs may feel that their Human Capital has increases for they deserve more money. ...read more. This student written piece of work is one of many that can be found in our GCSE Economy & Economics section. The writer demonstrates good understanding of all the economic terms in the question. Application is increased through the essay, making it more specifically related to the UK oil industry. More research into the UK industry would have been useful. The largest firms, such as Tesco often also benefit from external economies of scale. One way is the setting up locally of supplier firms. These firms are in competition with each other and often reduce their costs so Tesco will buy the product of them. How do economic systems solve the problem of scarcity? The Australian economy allows the market to drive production and the flow model while also using a level of Government control to control excess fluctuation in the market. The Australian Government does this by controlling interest rates, and running a surplus or deficit budget by lowering or increasing taxation or lowering or increasing Government Spending. progressing increase in the production targets.However, in generally production targets are not reached because of the lack of personal incentive and motivation to achieve beyond the target, opposed to a free market economy where the "competition" between firms and business drives the market. Net foreign debt, equity and liabilities are each measured in dollar terms and as a percentage of GDP. Both debt and equity create continuing outgoing streams of income to foreigners that are recorded as a debit item on the net income component of the CAD. An investigation is currently being carried out by scientists, funded jointly by the UK government and the mobile industry to look at the possible side affects of mobile phones when transmitting low levels of radio frequency emissions to humans. Many in the mobile industry are thought to welcome this new investigation, in the hope that it may reassure the public. Exploitation of workers: this is mostly in developing countries, where wages are put very low. To make profit, employers try to extract maximum work with minimum payment 4. Visible trade is the trading of goods whereas invisible trade is the trading of services. In order to get a balance the visibles plus the invisibles be equal or even a +. The next topic being covered is Invisible Trade.